Chris Shively, assistant professor of elementary education, will share his research “Taking the Next Step: What Should Happen after My Students Collect Science Data?" The first Great Lakes Center Seminar of 2016, “Coastal biota and anthropogenic stress in the Great Lakes,” presented by Katya Kovalenko of University of Minnesota Duluth. All faculty, staff, and students are welcome. Paul Seidler, Ph.D., postdoctoral research fellow at UCLA, will present "Tau protein fibrils: structure and inhibition." This seminar series is sponsored by the Faculty-Student Association. 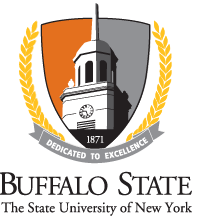 SUNY Louis Stokes Alliance for Minority Participation program helps underrepresented Buffalo State students majoring in STEM disciplines prepare for future graduate study. Students are provided with paid research opportunities and faculty mentors as well as workshops and other activities. Chemistry-Physics Departmental Seminar Series: Gamma-Hydroxybutyrate - Is It Exogenous or Endogenous? Presented by Hoda Moussa, candidate for the master of science degree in forensic science at Buffalo State. All students, faculty, and staff are welcome. Professional Science Master's seminar "New Strategies for RNA-Targeted HIV Therapeutics," presented by Benjamin L. Miller, Ph.D., from the University of Rochester Medical Center. Professional Science Master's seminar "Quartz Crystal Microbalance: Increasing Sensitivity of QCM Sensor with Polymers," presented by Ho Yeon Yoo, Ph.D., research scientist in the Chemistry Department. Professional Science Master's seminar "Methods Development in Organic Chemistry Producing a More Versatile Organocopper Reagent (or 30 Years of Starting Fires and Stinking Up the Lab!" presented by Greg W. Ebert, professor of chemistry.